And the whole sorry mess at the end. The round bottomed pot(top right) had one big fire spall that I was able to stick back on and save it. Lessons learned: Add more temper grit to the clay mix and pre-warm the pots before firing. Still two out of four is not too bad, pity about the beaker, I liked that one. Gutting, but as you say, it is a lesson learned and hopefully the next batch will go a little smoother. I still haven't even picked up some clay yet, but winter is coming so I may have a bit more time on my hands now. Firing them is literally make or break grrr. wow - even though they broke - thats a great picture could almost be back in time, i wonder if this is why on some sites we find so much pottery in the fields. Sure is, and domestic pottery is good at breaking! This is the one I was able to repair, it's amazing what you can do with pollyfilla and some model paint. The fire spall is at the front! And the other one. This was at the back of the fire and I'm not sure it properly fired all the way through, maybe this is why we don't find too much prehistoric pottery in the fields, if you do it's usually a tiny abraded blob. It's low temperature fired and trying to revert back to its origional clay state when in the earth. 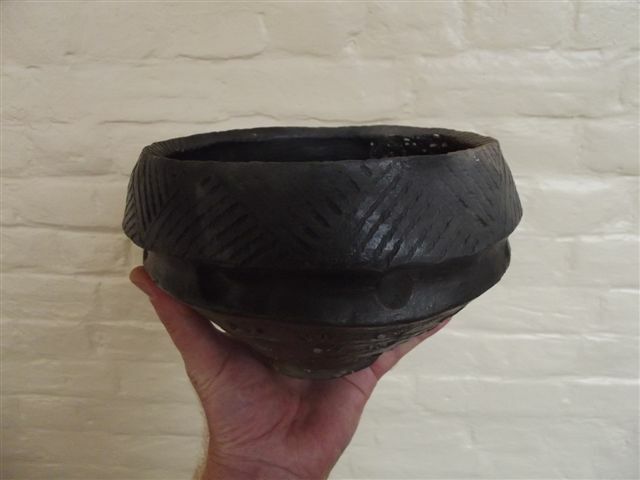 Very interesting experiment, a couple of questions, most open fire pottery I've seen hasn't turned black, also the decorations on the side, what's your conclusion? No idea! maybe the clay mix or the temperature or the carbon from the fire! Many variables, much more to learn. is the carbon only skin deep? i wonder if pots were fired in the hot embers. Nice little video, (short on actual information though) of Kelly Magleby who makes Anasdazi pots using traditional materials, tools and methods. That's really good to see, thanks for posting. 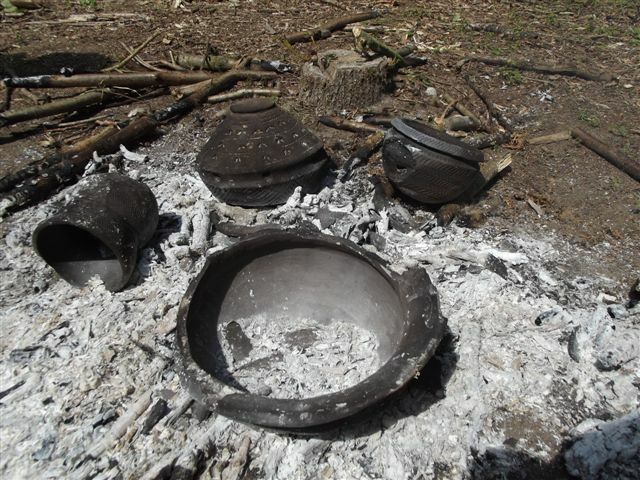 Most of those pots had really thin walls, that's got to help during firing. 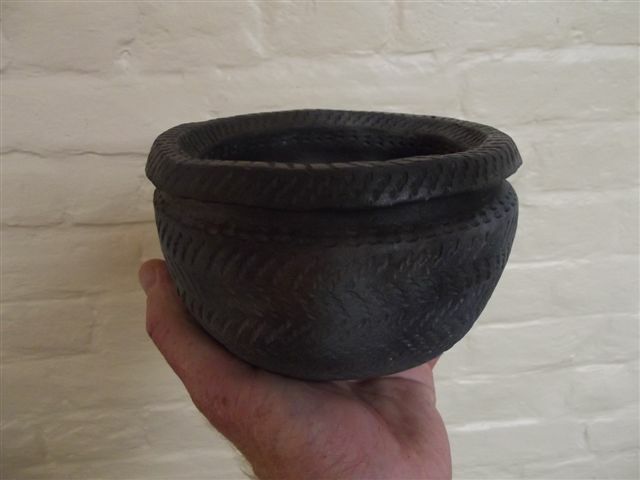 I've got to make at least three more pots soon, I'm planning to add some horse dung to ease the firing process and also pre-warm them this time. I'll post my progress when I get round to making them. Nice pots, beautifully decorated. Would love to have a go at making some myself but living in London it would be called arson pottery.